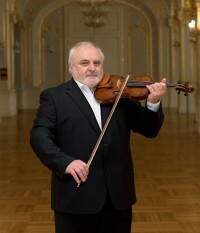 Ewald Danel studied the violin and conducting at the Ostrava Conservatory and the Academy of Performing Arts in Bratislava. He attended a conducting course with Prof. Karl Österreicher and a choir conducting course with Prof. Jan Wierszyłowski and completed his doctoral studies with Prof. Bohdan Warchal. After his studies he was Concertmaster of the Slovak Radio Symphony Orchestra and the Slovak National Theatre Orchestra for two years. Since 1985 he has been the Concertmaster of the Slovak Philharmonic Orchestra with which he also appears as soloist and conductor. In 2001 he took over the position of Artistic Leader of the Slovak Chamber Orchestra from Bohdan Warchal. Mr Danel has performed on the stages of a multitude of European cities and overseas (Japan, Korea, Egypt, Panama, Brazil, the USA). He cooperates on a long-term basis with the Orquestra Sinfonica Municipal São Paulo, Hiroshima Symphony Orchestra, Akita Chamber Orchestra, Tokyo Harmonia Chamber Orchestra, and has been a guest performer with the Klang Verwaltung München, Orchestra Ensemble Kanazawa, Nagoya Philharmonic Orchestra, Osaka Symphoniker, Sakata Philharmonic Orchestra, PKF – Prague Philharmonia, Orquesta Filarmónica de Málaga and the Janáček Philharmonic Ostrava a. o. He was the Chief Guest Conductor of the Hiroshima Symphony Orchestra from 2008 – 2014. Apart from his conducting and solo activities with orchestras and solo recitals he has a wealth of experience in chamber music, mainly as leader of the Slovak Quartet since 1986 and as co-founder of the Slovak Piano Trio since 1987. He stood at the origin of the Kubín Quartet (as violist) and played in the Musica Aeterna ensemble for many years. From 1992 – 1996 he was Artistic Leader of the Bratislava Chamber Orchestra Cappella Istropolitana. He cooperates in various chamber ensemble projects at home and abroad. In 2012 he was awarded the Sebastian Prize for his outstanding contribution to the legacy of the works of J. S. Bach. He taught at the Academy of Performing Arts in Bratislava from 1987 – 1998 and from 1999 – 2003 and 2007 – 2009 held the position of Guest Professor at the Aichi Prefectural University of Fine Arts and Music in Nagoya in Japan. In 2001 he led masterclasses for professional orchestral musicians at the Affinis Music Festival in Japan. At present he teaches at the Academy of Arts in Banská Bystrica. As the Artistic Leader of the Slovak Chamber Orchestra he leads many interesting projects, he has discovered several important unperformed compositions for the Slovak public and has significantly participated in the performance of new Slovak works. He initiated the Music in Churches cycle and introduced the idea of concerts for the disabled. Since Antonín Dvořák centenary in 2004 he has several times performed choral version of his Biblical Songs, lately at the Pohoda music festival in 2018 with the involvement of more than 250 singers. A large part of his artistic activities is taken up by long-term cooperation with amateur church choirs and music ensembles as conductor, organiser and sacred music composer.